Silent Hill Heaven :: View topic - Silent Hill 1 American commercial? Silent Hill 1 American commercial? Post subject: Silent Hill 1 American commercial? Does anyone remember the original Silent Hill commercial from 1999? I can vaguely remember the setting was an asylum. Does anyone still have access to the advert? I would love to see it again. Post subject: Re: Silent Hill 1 American commercial? You mean the magazine advert? Also, I heard that it was some TV commercial in USA, but I have never seen it. I tried to look on internet but without succes. 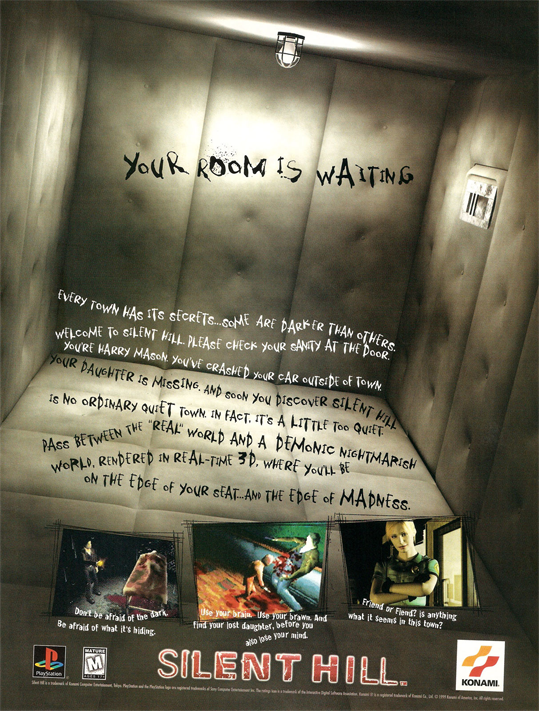 I remember that someone told that the commercial was based on this padded room used in this magazine advert, is that right? EDIT: lol i made a quick search now and i found it! this video was uploaded last year. I'd never seen either of those! Cool. I like the Japanese one better. Thanks. Maybe that was the one although I also remember a commercial with zombie like people in it. I remember the magazine ads, but not the commercials...good stuff! Don't be afraid of the dark. Be afraid of what it's hiding. I remember seeing that ad in a magazine when I was younger. Always thought that was a great line. In fact, that may be the very ad that inspired me to pick up SH in the first place. All at the mature age of ~10-11.